It wasn't just that it was a warm day in February, a day when the mercury would rise to 55 degrees, at least. This was the day that I was able to go for my first honest-to-goodness, bonafide, hills and dales RIDE. No more recovery ride on the Burke-Gilman trail, no city cruising on my Surly with a pannier on the rack. This was a real ride, on the Litespeed, the kind of ride with long stretches of no stops, with heart-pumping hills and twisting descents. A ride with a group of twelve COGS, using the corner system for the turns (which was mostly successful). A coffee stop but no pie at a new (for me) cafe that Larry, our sweep, introduced us to. Thanks Larry! 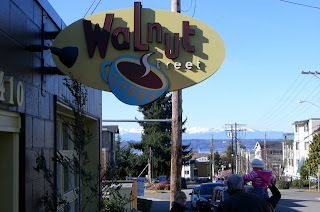 Views of the Olympics on this bright and sunny day and twelve bicycles with happy riders getting their caffeine fix at Walnut Street Coffee. 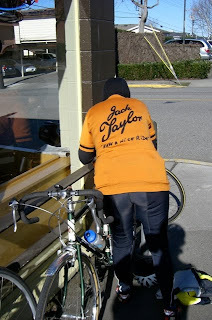 The return from Edmonds was cobbled together from poring over bike maps, Google terrain maps and street views and from a long-ago route of the RSVP event. First we went south, then east, then south, east some more, north, etching and sketching our way to Perkins Way, easily the best cycling road in the area, and back to Logboom. And I sweated on the bike for the first time in a long time and damn, it felt good. We did the following route, with a little 5-mile loop added in. Most people, following their leader blindly, weren't aware of it.